Robert E. Kennedy Library will expand its 24-hour room, add a glass ceiling to the atrium and improve the main staircase in the concept plan presented May 8. The campus hired architecture firm BNIM and strategy consultant Brightspot Strategy to reimagine the library. Both companies have consulted with students since October to create the concept plan. The library will be closed for approximately a year while the renovations occur, which could start next year, according to Gretchen Holy, the associate principal of BNIM. During that time, Holy said, different rooms around campus will be used as study spaces. “We’re trying to make 100 years of decisions on this building,” BNIM’s Director of Design Steve McDowell said. The 24-hour room may be expanded to the first two floors of the library. The glass ceiling above the atrium will open and close based on humidity and temperature sensors to improve the natural ventilation of the library. Campus Dining will have an area two-and-a-half times larger than Julian’s Café. It will be located where the print and copy shop currently is and will have seating. The main staircase will have a more natural step so it is not as difficult to walk to the top. Moving it is expected to add 3,650 square-feet. With other rearrangements to the library’s balconies and air conditioning room, 14,950 additional square-feet will be available to use in the library. 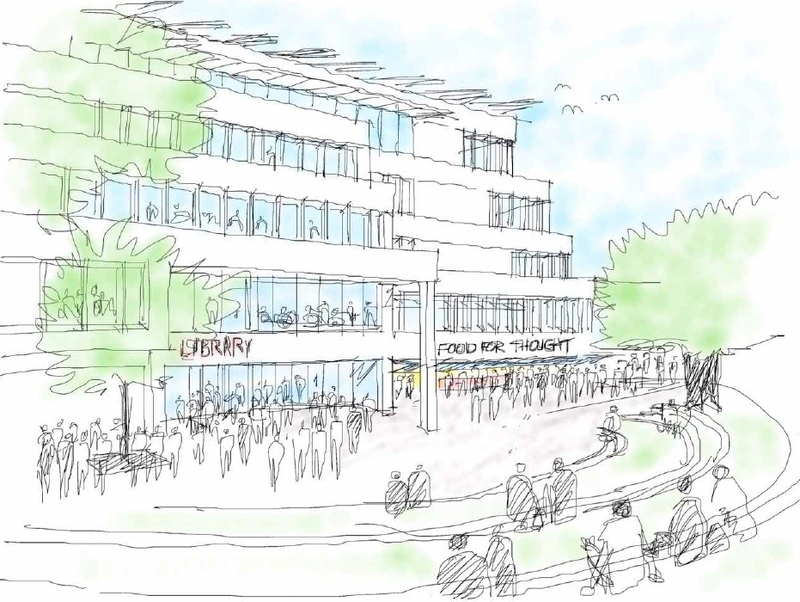 The library will gain 1,100 seats to increase the count to 3,500. “I think a lot of people have problems in the library because they can’t find enough seating, or it gets too warm, and this is going to help with both of those,” Ticktin said. Windows will be replaced with more transparent ones to improve natural lighting and special collections will have more storage. BNIM and Brightspot Strategy held town halls and meetings to consult with students, staff and administrators to decide the changes. More students expressed interest in a cafe and lounge seating than classrooms or more staff offices. McDowell said some of the project’s objectives are to reduce operating costs while increasing comfort, to create more usable space without building an addition, and to add connectivity. Improving the windows, increasing dining and adding space will help the library better meet students’ demands. “We really tried to honor the original intent of the building,” McDowell said, referencing the library’s mimicry of the mountains around San Luis Obispo. He added that he was fine-tuning the building rather than making drastic changes.